One aspect of being a photographer is that a voice at the other end of your phone can change your life. I received such a call from someone representing a magazine who will remain anonymous. 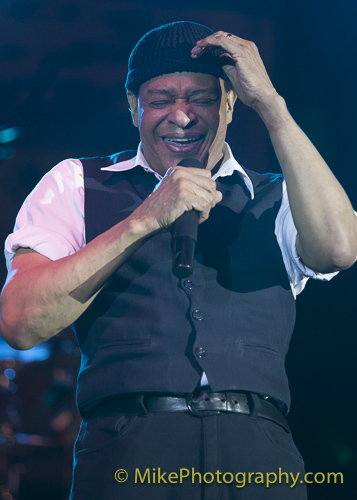 The assignment: photograph an Al Jarreau performance in Galveston, Texas. I heard Al Jarreau and missed everything else that he said. After he repeated the place and time and his info we agreed to terms and I regained a professional composure until we hung up. I left the house extra early on the big day, arriving at the venue in giddy anticipation wearing my glistening press credential proudly on my heart throbbing chest . I passed several empty tables and booths on my way to check out the concert hall. I sat in the front row, dead center seat in the completely empty arena and dreamed of that being my perch for the night. The sound of hard shoes on a hard floor made me turn to see a woman approaching me with a smile that suddenly turned to a scorned angry frown as she came close enough to read my credential. She began yelling at me “anonymous was supposed to help with representatives for the booths, and we are still waiting for the blank and blank!” My face flushed with shock and embarrassment as I struggled to explain that I had never met him, and that I was simply hired to photograph the concert. More people had heard the commotion and emerged from the stage wings. Two more people told me what had not been delivered by anonymous and that they could not even reach him by phone or get a return call. My heart sank as I realized that my association with anonymous was destroying any hope I had of remaining inside for the concert, much less having any photo privileges. More people arrived and had many questions for me... questions that I could not answer... questions that revealed to me that this person and organization had dropped the ball in every way. I remained courteous and heard them out. They had been let down and it was important that they finally had a receptacle for their anger. My patience was rewarded with an opportunity to respond. I hoped they would understand that I would never promise and not deliver. Ironically, broken promises were now potentially going to force me to break my commitment to anonymous. Speaking honestly and from my heart, I made my best case to be allowed to stay and photograph the concert. I kept my backpack on and my tripod in my hand. I did not take a seat in any of the thousand or so empty seats as I waited. I did not want to appear insolent and risk being told again to leave. I have often wondered who was the he who said OK? I will never know for sure, but I like to think that it was Mr. Jarreau himself. Who else had the power to overrule the others? I still felt a bit stressed due to the surprise drama that had unfolded upon my arrival, and was relieved to stay. Sadly, excitement and anticipation had been replaced by gun shyness and misplaced guilt… until the man himself took the stage. He is joy personified. He is a child in the best and purest of ways. His infectious enthusiasm dwarfs the standing ovation that swells behind me as more than a thousand of us are now on our feet. The sparkle in his eyes shines brighter than any of the stage lights. He is a man in love…absent of inhibition…and I am suddenly washed clean of any lingering negativity as I watch and listen and feel what he is sharing with everyone fortunate enough to be in this place with him tonight. He transforms what was the worst experience of my photographic career into a night I will forever treasure. Yes…his voice…his music…, but it is his infectious joy that rescues me. After the three songs, I looked back to see a woman take my vacated seat. She arrived with a man in a wheelchair and the two of them fit quite nicely in my seat… dead center… front row… next to the aisle.